JetBlue will roll-out its first “premium transcontinental” business class product on its New York JFK to Los Angeles route from June. 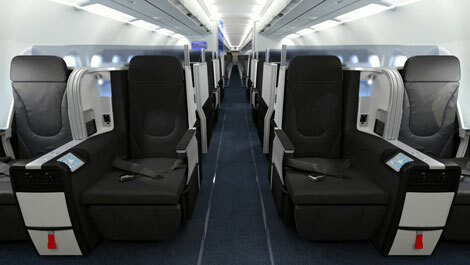 The fully-flat seating will first appear on the low-cost carrier’s 0930 departure from JFK to LAX on June 15. On October 26, it will debut on the airline’s San Francisco route. By the end of the year, all seven daily flights between JFK and Los Angeles will have Mint, as will all five JFK to SFO flights by the end of the first quarter of 2015. 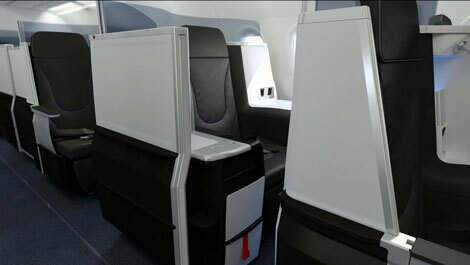 Installed on the front five rows of the carrier’s A321 aircraft, the 16 fully-flat seats, at six-foot eight-inches long and 22.3 inches wide, will be the first business class product to offer some passengers the option of having a fully-enclosed private suite thanks to a sliding door for extra privacy. The product will be configured 2-2/1-1, with rows one, three and five offering 2-2 seating, and rows two and four fitted with 1-1 private suites, one each side of the aisle. (Watch a demo video above). Other features will include adjustable air cushions, a massage function, a 15-inch entertainment screen, a “wake me up for service” indicator, men’s and women’s amenity kits by Birchbox, and super-fast wifi internet access at no extra charge (for now). Mint passengers will also get: a pre-departure drink, followed by a cocktail and an amuse bouche once cruising; a menu by New York restaurant Saxon + Parole featuring a choice of five tapas-style meals (customer select three) plus dessert; wine and other alcoholic drinks; and fresh coffee made by “the first purpose built cappuccino machine for a US airline”. There will also be a snack station. What was the thinking behind launching Mint? Hayes said: “We had a segment of customers that flew us up and down the West Coast network but they flew with other airlines across the country, so when we drilled down into that, we found we needed to upgrade our product. “We then asked how can we reinvent the business model to offer a really compelling product but at a much lower price point. If people are paying US$2,000 a ticket we think that’s too much, we think the general public are getting gouged on New York to California. Hayes explained that it is the introduction of new A321 aircraft — its current fleet is only made up of A320s and Embraer 190s — that “has made it possible”. He said: “We are taking a new delivery of nine planes, and using that extra bit of real estate between door one and door two to turn it into a premium cabin. He adds: “We take a unique position in the US in that we are not a network carrier and we are not an ultra low-cost carrier. We are serving the underserved – we are not targeting the platinum-status road warriors with a million miles, they get very well taken care of by the network carriers. Last month, JetBlue announced that it was expanding its codeshare agreement with Japan Airlines from the end of March, with routes including US domestic services such as San Francisco to Austin and New York to Buffalo, along with Japan to US schedules between Tokyo Narita and New York, Tokyo Haneda and San Francisco, and Tokyo Narita and Boston. Hayes said: “We have 32 airline partners now and we have codeshares with a handful of them. Our growth in Boston has been really significant and it has allowed us to encourage international airlines to look at the city in a different way. What JetBlue isn’t planning to do is to join any of the airline alliances. Why? Hayes concluded: “We have grown to six focus cities, New York, Boston, Fort Lauderdale, Orlando, LA and San Juan, and will have 203 aircraft in our fleet by the end of the year. I think the US industry is in very good shape at the moment. “The economy has recovered somewhat since the crash, but more importantly in the consolidation that has been taking place — Delta and Northwest, American and US, United and Continental — and that has taken a lot of capacity out of the market.